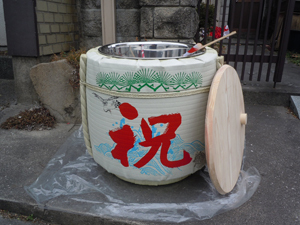 Sake barrel used in a kagami biraki ceremony. underneath is said to resemble the moon. (opening the mirror) comes from. Kagami biraki is a 300 years old traditional Japanese ceremony, which literally means "Opening the mirror". 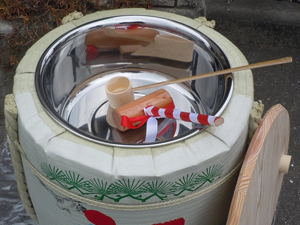 The ceremony involves either the opening of a taru(barrel) of sake or the breaking of a pair of large round kagami mochi. 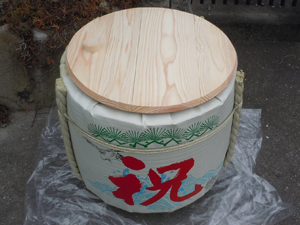 Both the lid of the sake barrel and the kagami mochi is broken with a wooden mallett called "kizuchi" in Japanese. 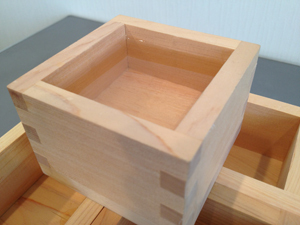 Finally in the case of the sake barrel opening, the sake is filled into masu cups using a wooden ladle called "hishaku". Originally kagami biraki was a New Year's ceremony held on the 11st of January, since in Japan odd numbers are said to bring good fortune and luck. The ceremony of opening a sake barrel originates from the 4th Tokugawa Shogun, who has ordered to open a barrel of sake before an important battle to bring good luck to the army. The battle afterwards was successful, so this ceremony became a very popular custom. Nowadays kagami biraki is so popular in Japan that it's held on various events: weddings, business openings, construction completion ceremonies, sport events(especially karate, kendo, judo, aikido and other martial arts) and other noteworthy, significant events. Hold your own kagami biraki and we will help you get all the necessary items directly from Japan!